The 2.0.0-RC1 is in our release repository. The final release will be on Maven Central as well. 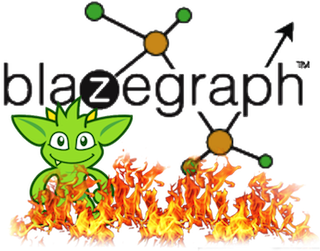 If you add the releases repository, the com.blazegraph.bigdata-core artifact should work for you. If you are using Blueprints, you’ll also need bigdata-blueprints. Let us know how it goes. Hi, I was running the Star Scheme Benchmark (adapted for Linked Data, as shown here http://people.aifb.kit.edu/bka/ssb-benchmark/) on Blazegraph v1.5 and the results show very good performance. Generally the query processing time is liner to the size of data (which is determined by a scale factor in SSB term), however on a certain size (i.e. scale factor 1) there’s a sudden performance boost that’s not observed on other sizes (i.e. scale factor 0.25, 0.5, 2). I couldn’t figure out why and would appreciate if you can provide some hints. I’m more than happy to provide more details of the benchmark results if you’re interested. Great — yes, we’d be very interested in taking a look. Please post or send along when you can.